Saventaro®4 / 90 Veg Caps - Nature's Way®. Why use a POA (Pentacyclic Alkaloid) cat's claw extract? Saventaro® is a standardized extract free of harmful levels of certain substances, called tetracyclic oxindole alkaloids (or "TOAs"), commonly found in traditional cat's claw extracts. The powerful plants used in Saventaro® come to us through the generosity of the Ashaninka people of Peru. In return, a percentage of the proceeds goes toward financial support for education, medical care and the vital protection of their rainforest lands. Take 1 capsule three times daily for the first 10 days, and 1 capsule daily thereafter. If pregnant, nursing or taking any medications, consult a healthcare professional before use. Saventaro® is a registered trademark of IMMODAL Pharmaka GmbH Austria and is made in the USA under license from IMMODAL. Protected by U.S. patents 5,723,625 and 7,238,374. Additional patents pending. 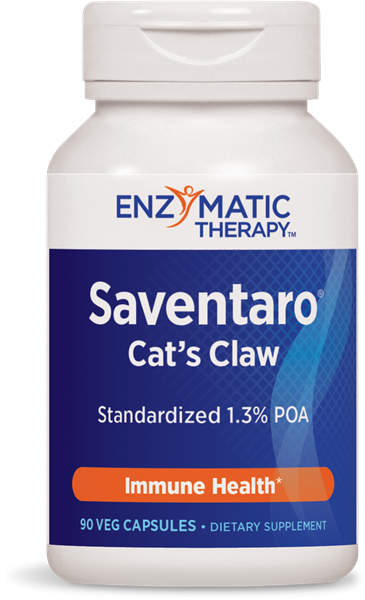 How is Saventaro® different than other Cat’s Claw products? Can I take Saventaro® daily?